This hike begins on Forest Road #2150.040 near what is commonly referred to as the Berry Patch. The trail climbs gently for the first half mile then begins a slow descent to Goat Creek. Most of this part of the hike is in dense forest with very few view opportunities. After crossing the creek the trail begins to climb steeply through a number of switchbacks and talus slopes toward Snowgrass Flats. At about 4 miles, just before entering Snowgrass Flats, bypass Trail #97 heads east as an alternate route allowing the hiker to do a loop hike. 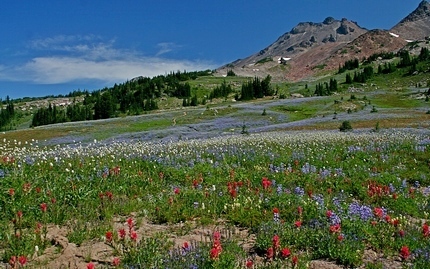 Taking the bypass trail, you will encounter some of the most amazing floral displays anywhere in the Goat Rocks Wilderness, if you get there in mid-July. This bypass trail is a mile long and crosses a small stream on its way to the Pacific Crest Trail #2000. 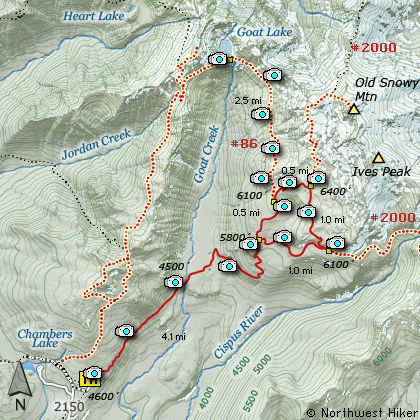 When you reach the PCT, bear left and follow it another 2 miles to the junction with the Snowgrass Flats Trail #96. Follow Trail #96 back down to Snowgrass Flats and return the way you came after passing the bypass Trail #97. Travel east on US Hwy 12 for about 48 miles to Randle. From Randle travel east on US Hwy 12 for about 13.3 miles to the junction with Forest Road 21. Turn right (south) onto FR21 and follow it uphill for about 5 miles. At this point you will see Forest Road 2110 on your left, which is the road to the Glacier Lake trailhead, but you continue straight ahead on FR21. In another 8.1 miles you will come to the junction of Forest Road 2150. Bear left onto FR2150 and follow it about 3 miles and you will pass the junction on your left which leads to the Chamber Lake campground. Continue ahead just a short distance, and you will come to a spur road on your right. This is the entrance to what is referred to as the Snowgrass Flats trailhead. This hike and many more begin here.